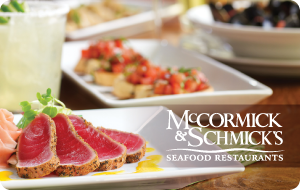 At McCormick & Schmick's Seafood & Steaks, you will experience culinary excellence at its best. Menus are created and printed each day after the early morning delivery of fresh seafood and shellfish from the Pacific, Atlantic and Gulf of Mexico. If you enjoy beef, pork or poultry the diverse selection of perfectly aged steaks, thick pork chops and locally sourced fresh chicken will exceed your expectations. Stop by our bar to enjoy one of our famous happy hours! Landry�s, Inc. DOES NOT allow for mobile redemption at this time. Please print this email with the eGift Card number and present it at the time of redemption. This Card may be used to purchase goods and services at any Landry�s, Inc. or affiliated location in the U.S. until the full balance is used. The Card has no cash value; except as required by law, it is not redeemable for cash. It will not be replaced if lost, stolen, altered or damaged. Any resale is strictly prohibited. For balance inquiries, call 1-888-345-8380. For more information: www.landrysinc.com.